Roofing materials are external layers on the roof of a building, either self-supporting or supported by an underlying layer. They provide shelter from natural elements and offer excellent insulation. Roofing materials comprise natural products, such as thatches and slates, and commercially available products such as tiles, metals, and plastic sheeting. With advancements in building techniques and increased varieties of materials being used in roofing systems, it has become difficult to select correct material for roofing systems. A metal roofing is a durable, versatile, and easy-to-maintain building material. Booming construction industry across developing economies led by rapid urbanization and rise in the demand for energy-efficient and eco-friendly roofing systems are factors driving the global metal roofing market. Rise in the demand for green construction materials and materials with low lifecycle cost, growth of the construction industry, and government initiatives for green construction materials are key factors driving the global metal roofing market. The metal roofing market in Asia Pacific has been expanding since 2016 due to rapid urbanization, growth in population, and increase in industrialization in the region. The outlook for the market in Asia Pacific appears promising. Significant growth of the construction industry and increase in usage of eco-friendly roofing materials in end-use industries are major factors boosting the global metal roofing market. Moreover, adoption of solar power and energy codes in roofing systems continues to influence the metal roofing market. Increase in the consumption of recyclable roofing materials and lightweight, flexible materials is fueling the global metal roofing market. Metal roofs play a major role in attaining sustainable roofing, as they are made from a high percentage of recycled materials. Metal roofs is a durable and long-lasting building material that can provide significant energy savings to the building envelope. They can also improve energy efficiency factor of buildings. Furthermore, growth of residential and commercial sectors in developing economies is another factor estimated to augment the metal roofing market during the forecast period. Metal roofs are 2–3 times costlier than conventional roofing systems. This hampers the market. However, advantages of metal roofs such as long-term durability, eco-friendliness, and high energy efficiency are likely to boost the demand for metal roofs from the construction industry. Furthermore, increase in repair and refurbishment of existing buildings is likely to provide lucrative opportunities to the metal roofing market in the near future. The global metal roofing market has been segmented based on metal type, type, construction type, and end-user. In terms of metal type, the market has been divided into steel, aluminum, copper, and others (including tin, titanium, and zinc). Steel was the dominant segment, holding more than 60% share of the global market in 2017. In terms of type, the global metal roofing market has been classified into flat seam, batten seam, standing seam, corrugated, and others (including shingles, panels, and through-fastened metal roofing). Standing seam was the leading segment, accounting for about 25% of the market share in 2017. Standing seams are employed in all types of metal roofing systems. Standing seam roofing offers several advantages over other types of metal roofing. It is long lasting. It offers reliable and maintenance-free protection. In terms of construction type, the metal roofing market has been classified into new construction and renovation. Owing to its durability and flexibility, metal roofs are widely consumed in the renovation type of construction. Based on end-user, the global metal roofing market has been segregated into residential, commercial, and industrial. Demand for metal roofs is largely driven by rise in output of the construction industry. Urbanization initiatives and steady emigration have gained momentum in several developing economies, thereby driving the construction industry. This, in turn, acts as a primary factor boosting the metal roofing market in these countries. Additionally, steady emigration is expected to ensure high demand for new housing, leading to stable demand for metal roofing products. In terms of region, the global metal roofing market has been segmented into North America, Latin America, Europe, Asia Pacific, and Middle East & Africa. Asia Pacific experienced the maximum demand for metal roofs in 2017. Overall economic growth, increase in industrialization, and rise in urbanization in China, Vietnam, India are fueling the metal roofing market in Asia Pacific. The metal roofing market in North America is expanding at a moderate rate, due to increase in re-roofing activities in developed economies such as the U.S. and favorable housing loan plans for expatriates. In Europe, the metal roofing market in Germany, the U.K., Italy, France, and Russia is fragmented. Middle East & Africa is expected to be a prominent region of the global metal roofing market during the forecast period, due to growth of the construction sector and increase in government expenditure on commercial and industrial sectors in the region. 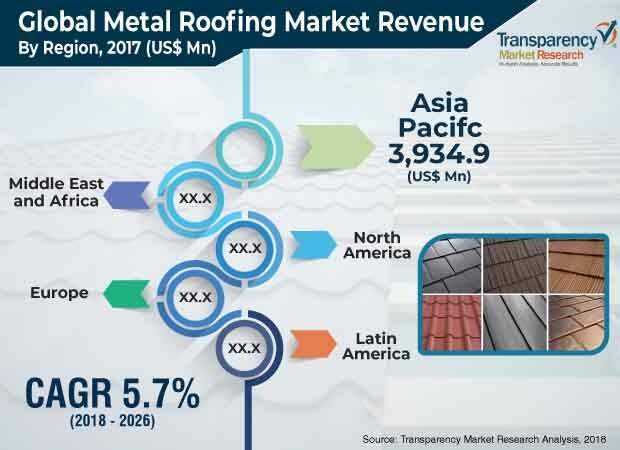 This is also projected to create significant opportunities for metal roofing manufacturers in the near future, primarily in the industrial sector in GCC. Key players profiled in the report on the global metal roofing market are Owens Corning, Saint-Gobain S.A., Carlisle Companies Incorporated, ATAS International Inc., Tegral Building Products Ltd. (Tegral), Etex, Safal Group, Sunlast Metal Inc., Metal Sales Manufacturing Corporation, Thompson Architectural Metals Company (TAMCO), SKC Thailand Co. Ltd., CSR Limited, Coastal Metal Service, and Worthouse.